2019 looks set to be another busy year, I will be looking forward to working with several galleries as well as self-representing. Also the curated Artel group exhibition 'Fragment' in early August. 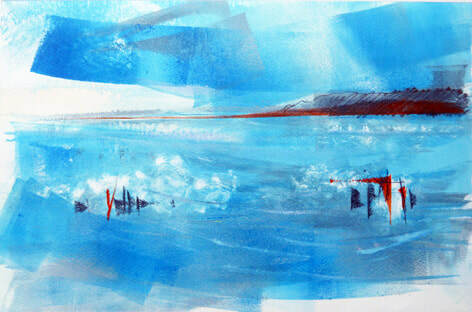 I will be exhibiting at Emsworth Art Trail and Arundel Gallery Trail. St Hubert's fundraising has been very successful so they will be commencing building repair works which will mean the exhibition will take a break in 2019 but we will plan another in the future. Art Wittering collective exhibition weekend returns end of October 19. I will send updates to my mailing list. If you wish to be added please send me an email to richardsdj@btinternet.com. This website contact form is proving unreliable. I mail out a short note approximately four times per year. Thank you. I have one new work in this exhibition representing the artists who exhibited at the gallery during it's second year. I have two works in this exhibition – both seascapes featuring blue and orange! I am delighted to have been invited by Victoria Saunders to exhibit alongside other selected artists for her first exhibition at the Red Dog Gallery. 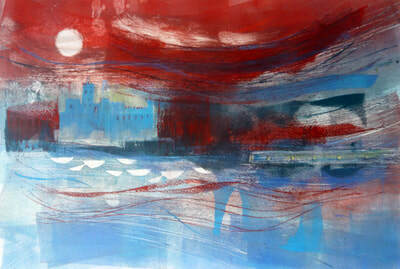 The gallery will be open from 10.00am to 4.00pm each day and until 7.30pm on Wednesday 17th or by appointment. Launch of the new Art Wittering group. The second fundraising exhibition that I have curated at this special location with 30 invited local and professional artists, showing all genres of art and craft including some land art installation. 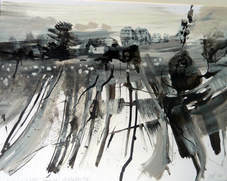 I will be exhibiting some oil on paper monotypes of local landscape and other smaller works relating to the South Downs area, new greetings cards. This year I am proud to have my image of Bosham Harbour selected for the front of the brochure and for the poster. 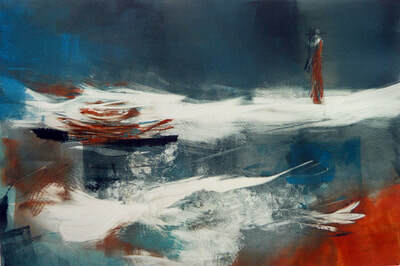 This oil on paper monotype will be available at the exhibition. I will be exhibiting at a new venue in Surrey Street/School Lane above the Library. There will be refreshments available and on street parking very nearby across the roundabout near the health centre. Open at weekends and Bank Holiday from 12.00 noon until 5.30pm and weekdays from 2.00 until 5.30pm. However I will be there each day from 12 noon. I have some coastal work in this exhibition representing the artists who exhibited at the gallery during it's first year. ARTEL is a professional contemporary art group of 20 artists that I was invited to join last year, they work to a theme each year for their Summer Show. ‘Elemental’ will include sculpture, printmaking and painting, textile art, photography and mixed media. 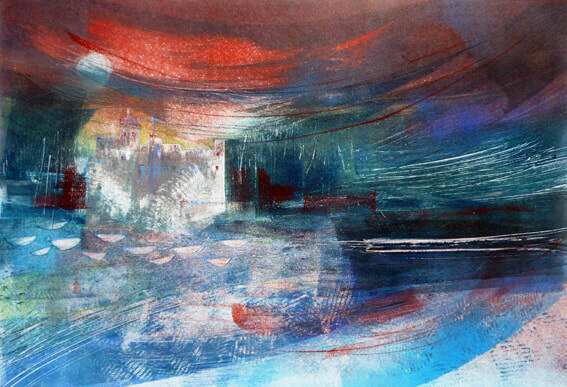 I have made a special range of new monotype works about making journeys across the Solent in sequences. 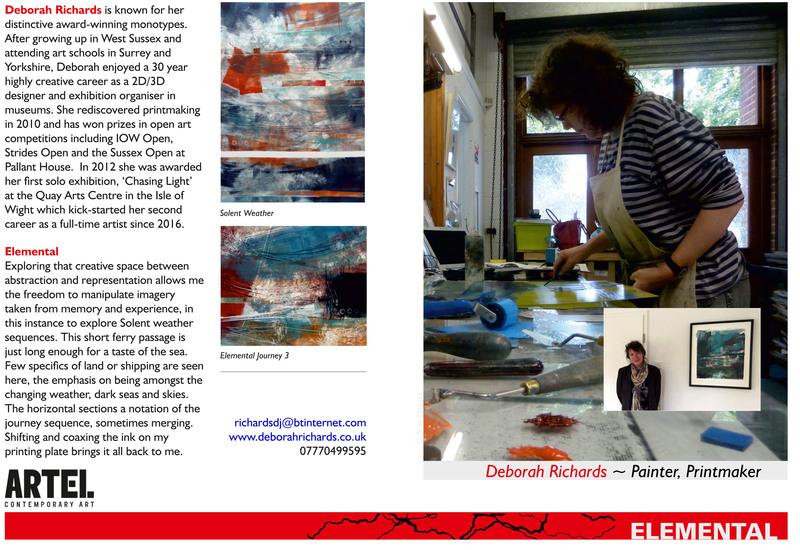 Please download the leaflet explaining my Elemental work below. I will be exhibiting prints at this delightful gallery near the sea with some fellow printmakers. This exhibition is part of the Chicheter Festivities programme. This year I am there every day and sharing the space with five other artists. This inspiring round light-filled venue made from straw bales and wood is between Emsworth and Southbourne, walking distance for some but there is a free car park onsite or the 700 bus stops nearby. Tea and coffee will be available. 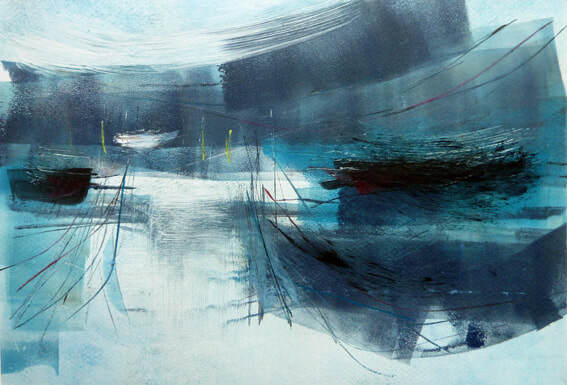 Described as expressive and romantic, this latest collection of semi-abstract paintings, monotypes and drawings will transport you into my own interpretation of real and imagined sea crossings and journeys. 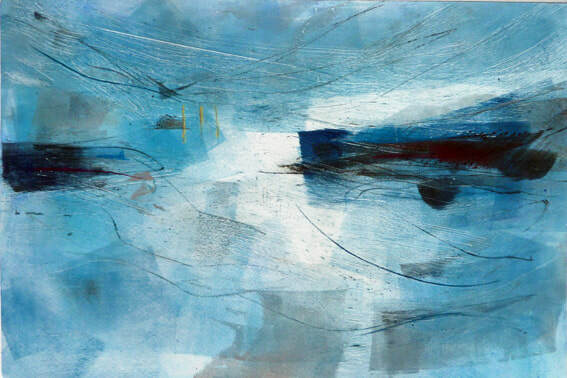 Observations of changing light and weather, impressions of harbour and shore, inspired by the local Solent coast, South Downs area and Fowey river. Unique prints, paintings, drawings and cards for sale. Free on site parking. Disabled access. Refreshments available. 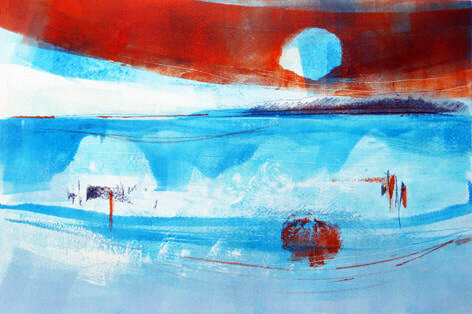 I will be exhibiting a selection monotypes at this delightful new gallery. 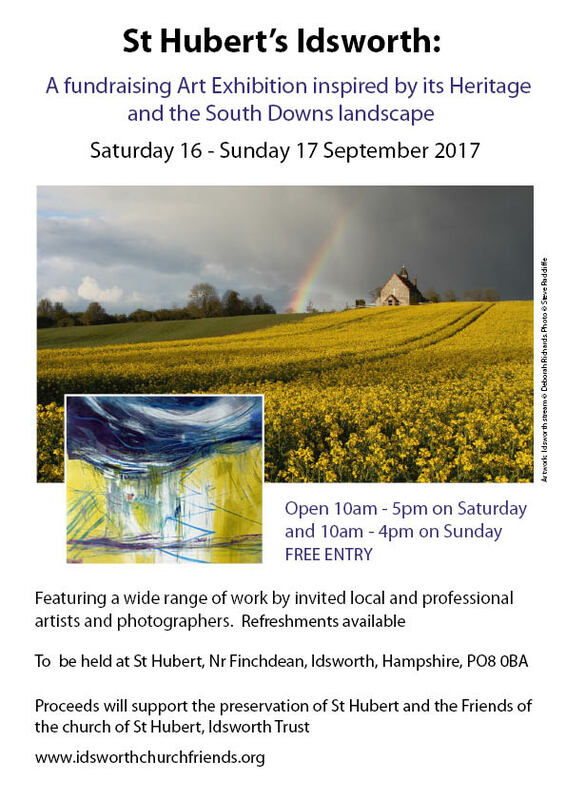 The seventh annual Autumn Affordable Art Weekend celebrating the talents of a group of Chichester artists. This group of friends will be displaying work from ceramics and glasswork, to textiles, prints, photography, drawing and paintings. There is a range of work accessible to all in price range and variety of styles. The artists will be there to chat to visitors about the creative work. All artwork is available to buy with many items making special, unique Christmas gifts. Tea & coffee is available. Admission and parking free. A special fundraising exhibition towards vital repairs to be held at St Hubert chapel also known as 'the church in the field'. I have invited over 30 professional and local artists who will be exhibiting work themed to this special place close to where I live. 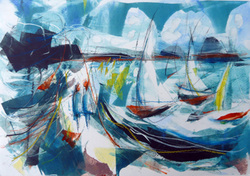 This wonderful mix of artworks will include Printmaking, Painting, Photography, Ceramics, Millinary, Glass and Sculpture. I am looking forward to making a new body of work for this show. Artists confirmed are: Ruth Barratt-Danes, Jon Barratt-Danes, Pippa Blake, Heather Bowring, Jean Bradley, Victoria Brown, Polly Dutton, Annie Evans, Annie Flitcroft, Linda Foskett, Chris Gilbert, Jan Guest, Sandra Izzard, Sue Hawksworth, June Heap, Jessica Maier, Steve Radcliffe, Trudy Redfern, Deborah Richards, John Robinson, Nicola Rose, Alison Sandeman, Karen Ongley-Snook, Garrick Palmer, Mike Savage, Andrew Whitmarsh, Bridget Woods, Clive Vosper and one or two more to be confirmed. The exhibition has disabled access by driving through the gate up to the church, there is free parking on the road and tea and coffee will be available. I will be in residence each day the exhibition is open. Other artists to be confirmed. I am very pleased to have both my monotypes accepted for this selected exhibition. 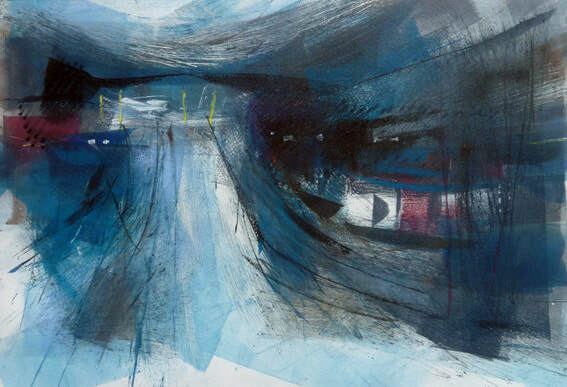 Both pictures are on the theme of leaving and travelling to the Isle of Wight, oil on paper, one with graphite. This is a selling exhibition which supports this fantastic venue. Selected marine-based works and artefacts from the Isle of Wight Council Heritage Services will also be displayed in the exhibition, revealing a wonderful array of works inspired by the Island’s coastline. A full programme of live events will accompany this exhibition as well as a school’s response show in the gallery. 19 - 28 August at Venue 39, The Victoria Institute, in Tarrant Street. I will be part of the Arundel Gallery Trail in August 2017. 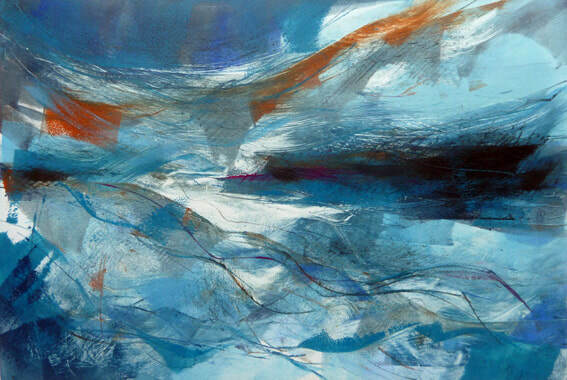 Delighted to once again be exhibiting at the atmospheric Victoria Institute, in Tarrant Street. 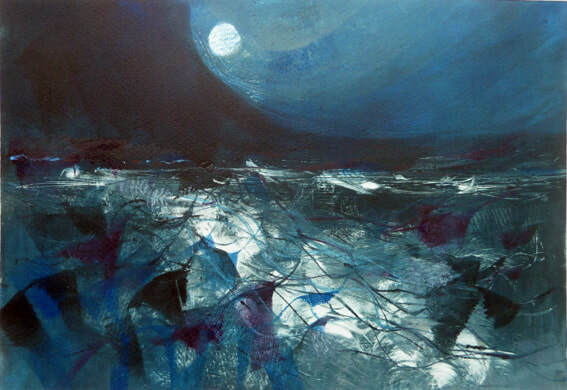 Looking forward to showing new large monotypes framed size 1000mm x 700mm including a similar oil on paper monotype to one selected for the Isle of Wight but with a pink moon! Also made in July 2017 two of Hanover Point one of my favourite Isle of Wight places looking west towards Dorset. 26 August – 6 September 2017. Open daily 8.30am – 5.30pm. 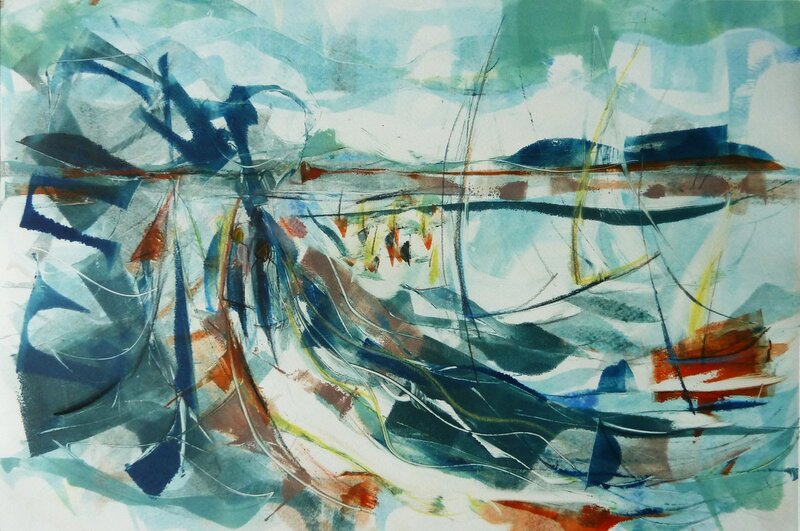 I am showing some monotypes on a Solent theme in this large exhibition specialist exhibition of handmade prints by a diverse group of printmakers at this lovely venue. This year I am pleased to be exhibiting in the wonderful new light-filled round exhibition space at Tuppeny Barn between Emsworth and Southbourne. There is easy free onsite parking and cafe. 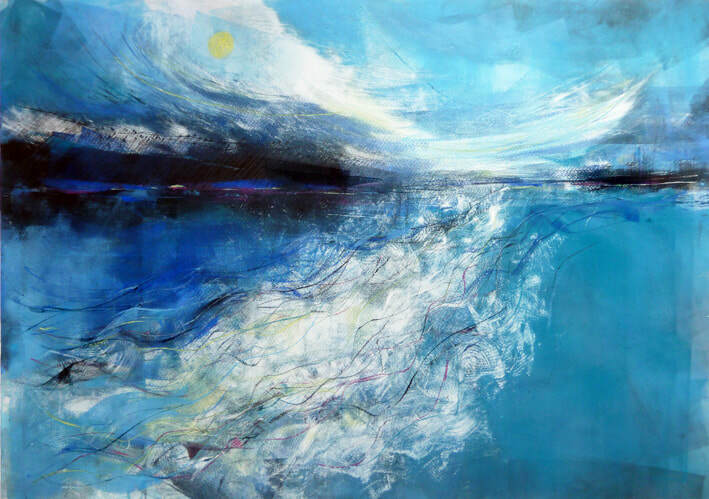 I will be showing new paintings, prints and drawings responding to my favourite themes of changing light, rhythm and mood of the Solent coast and local downland. 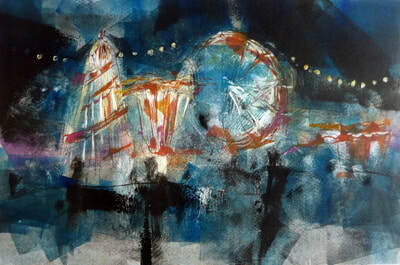 Some fairground imagery too. Affordable one-off mini prints and cards. Expressive figurative stoneware sculptures. Commissions welcome. © 2019 Deborah J Richards. All rights reserved.